I also noticed that the Belhaven Black Scottish Stout is now a seperate listing from the Belhaven mixed six pack. Only $3.20 for 500ml A great price. Sad to hear of another sub standard IPA taking up valuable shelf space. cagiva650 wrote: "Wells IPA" now at the NLC. $3.62 for 500ml. Only $2.15 at the LCBO in Ontario. Is this the same beer that used to be in a 2 litre plastic bottle in Ontario a few years ago? Yup, that's the old cheepo IPA that used to be in many other larger formats (I seem to remember a big king can like Colt 45 at some point too). It's actually cheeper at the Beer Store when you buy an 8-pack (around $2 a can). This is a beer for homeless people. I don't know why it's so expensive in NL and I really don't think it's even worth the "tick." It's even more notorious than Waterloo IPA for being a poor beer and is only slightly more of an IPA than Keiths or India Beer. I was told that India beer was named after a dog called India. I don't know if its true or not but it made for a good story. I was told the same. Named after the family dog, which explains the picture of a dog and the "Man's Best Friend" Slogan. Can't confirm though. Anyone? OK, here's what my research has come up with regarding the dog. 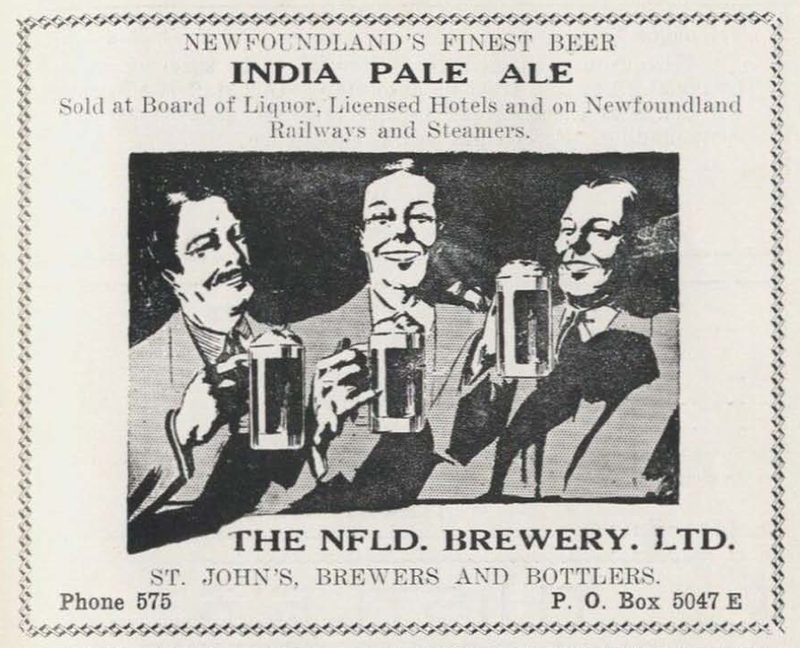 The Newfoundland Brewery (which existed from 1893-1962) has almost always had two brands with "india" in the title: their India Pale Ale and their India Beer. Both of the above labels are from the 1950s, 1954 is the current best guess. The above advertisement for India is from the Newfoundland Who's Who from 1937. This seems to pre-date the use of the dog, meaning that almost certainly both brands (India Beer and India Pale Ale) are references to the historic IPA style to which they would likely conform. This would make since given that prior to the 1930s (afterwords they were primarily German except during the Second World War) Newfoundland's brewmasters would have had done their training in English or New England, where the style was still common. See Mitch Steel's book on the history of the IPA style for more on that. 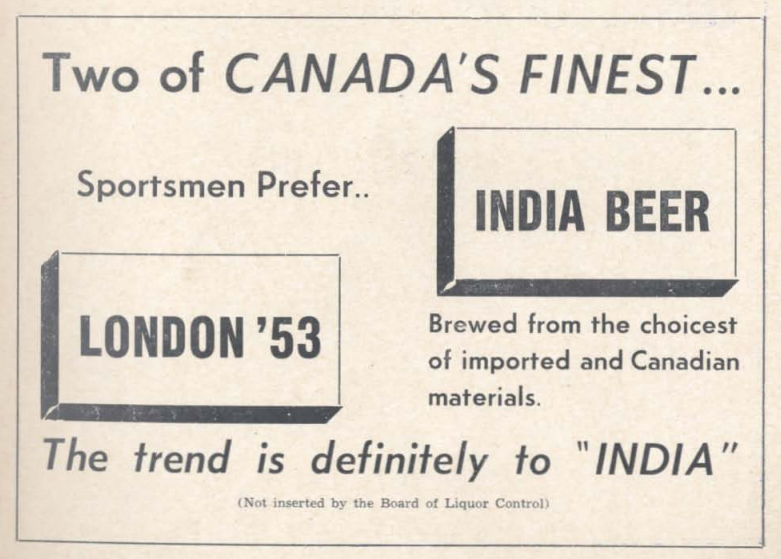 In the 1950s the Newfoundland brewery also brewed a London '53 beer (I would guess a Porter, by I have no evidence for that), so advertising an India Pale Ale along side that would indicate that both India Beer and their India Pale Ale were their versions of India Pale Ales, and not named for somebody's dog. In short, the historical evidence puts the naming firmly in the category of both India Pale Ale and India Beer being named after their style, an (English) India Pale Ale. Whether the dog? 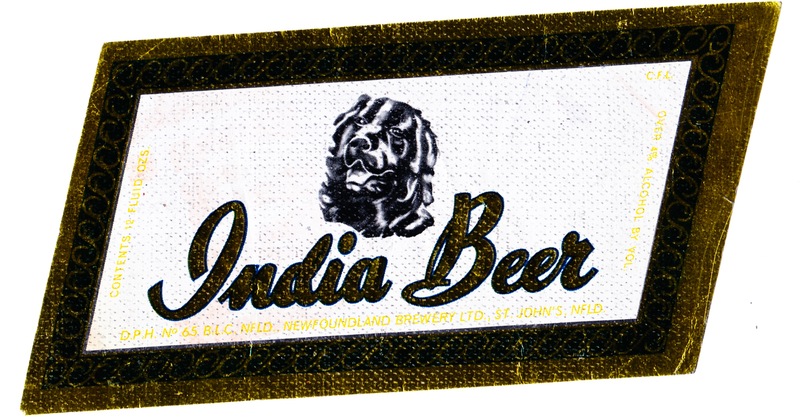 By the 1950s (when the first labels appeared) there was a Newfoundland dog's head on India Beer and a whole dog on India Pale Ale. Was the dog named India? Perhaps! 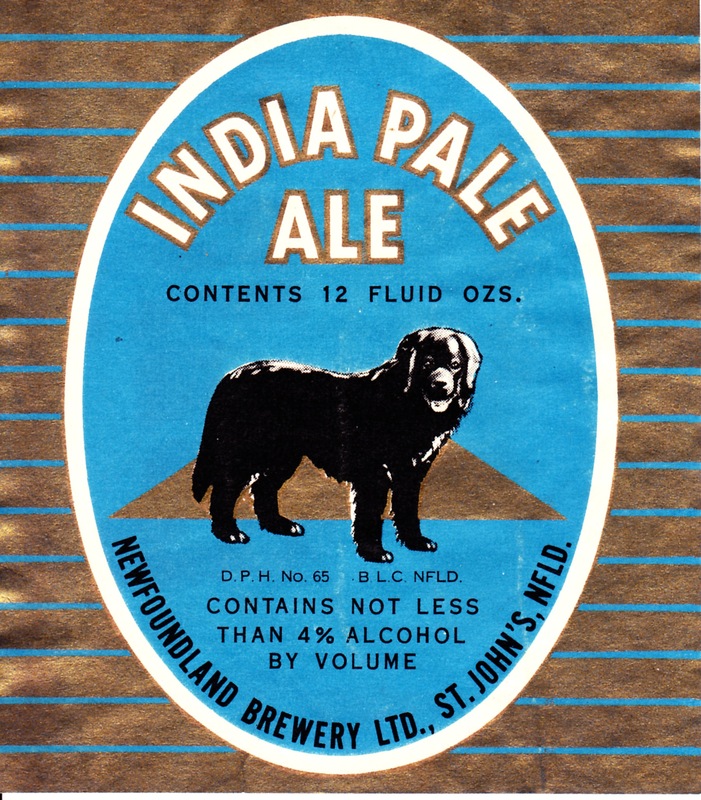 It is unlikely that the beers were named after the dog, but it's perfectly plausible that a dog named india inspired the branding people at the Newfoundland Brewery to put a dog on the label. Alternatively, they could have looked to one of North America's most powerful brands, Black Horse (this was long before it was in Newfoundland), and borrowed the iconic animal-silhouette trope. Or they could have simply wanted to make the beer a distinctive Newfoundland product by using the image of a Newfoundland dog. As for the "man's best friend" slogan, there is no real evidence of that existing until more recently and it certainly wasn't used in any of the early advertisements for the brand in the 1930s and 1940s; again suggesting that the beer came long before the dog. Either way, it's highly unlikely that the beer was named after a dog named India. 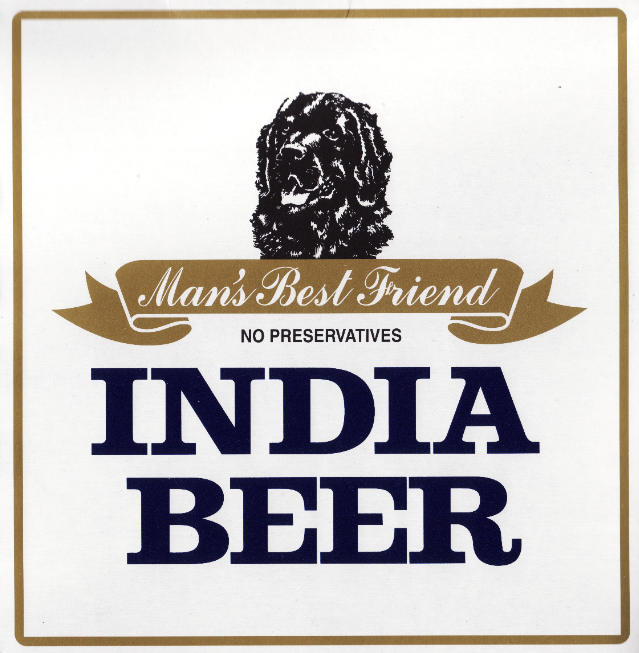 Why they put a Newfoundland dog on the label is at best speculative right now, but both beers were squarely within the contemporary trends to brew various styles of (English) India Pale Ales. I'll post this again on nlbeerhistory.com so we have an partial answer to the question for those googling.